1. The product meets ANSI/ISEA107-2010 Class E performance requirements and uses all certified reflective material. 2. When combined with a class 2 jacket this ensemble becomes a Class 3 overall with extremely high visibility. 3. Built for the outdoorsman who values high reflectivity, breathability and comfort. 4. Two pockets on both side for containing your items. 5. The product has 360 degree silver reflective tape encircling each leg to enhance visibility and protect the user. 6. The product is with mesh lining and has elastic waistband with drawstrings to make it comfort-fit. 7. The product completes the set with the matching Class 3 hi-vis reflective rain jacket. 8. The way of logo imprint: silkscreen, full color heat transfer, reflective logo imprint. 9. The regular styles can be shipped out immediately. We can print your won logo or text in various colours. Changing the colors, reflective tape, fabric or adding pockets, etc. are also available. Please contact with our sales if any specific requirements are needed. Looking for Waterproof Reflective Pants? 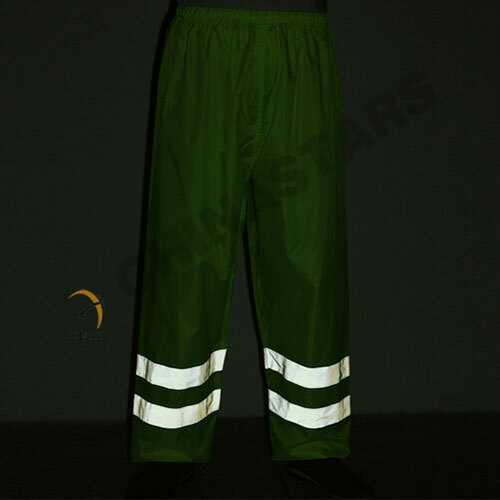 Look no further than our lightweight ANSI/ISEA 107 Class E reflective rain pants with elastic waistband and 2 inch silver reflective tape. 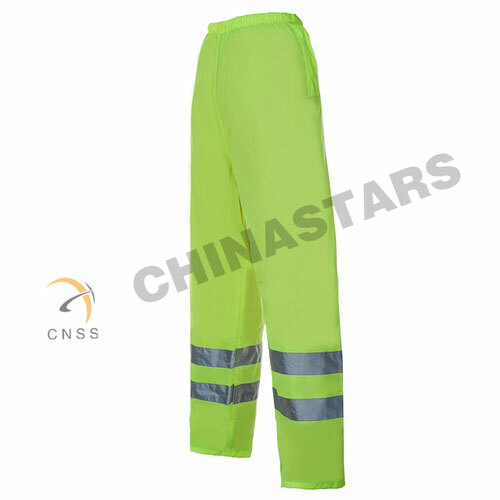 Our reflective safety pants complete the set with the matching Class 3 hi-vis reflective raincoat. Most of our heat transfer film contains aluminum layer, and sweat /oil/ water stains may occur if the surface of the product has direct contact with hands during application and is then exposed to hot and humid conditions. Even though these blemishes won’t affect performance of the product, we strongly recommend handling the reflective fabric with gloves and keeping them in the environment of below 26.7 °C (80 °F) and lowering than 70% relative humidity. glass beads on the retro reflective fabric can be worn off by rough texture. heat can damage the reflective fabric.